For the past couple of days, i've been thinking if DotA/DotA 2 is somewhat better played at higher fps just like in Counter-Strike or the average fps is quite enough? Uhm, as far as I know, you can get maximum 30 frames per second, but I'm not sure. But you must disabe vertical sync and triple buffering. I agree with dukthor, you can change frames in console. However, i recommend Borderless Window and your real resolution. If u have bad PC put all off except water in options and Textures to Low. That is for bad PC`s. If u have a good PC u can leave all ON and on MID/High. The advantage of Borderless Window is that you can Tab anytime you want without laggs or delays. I wish I have a PC that really is for gaming, my PC right now can still handle Dota 2, but crappy graphics, my mouse is cheap, my keyboard is dying and my computer is 2 years old. But that doesn't matter gaming is still my passion . I do really believe a good frame rate is absolutely necessary at any time especially during intense team fights where you need to see every single spell and stuff. I recommend you to remove the antialiasing (it's what use the most power for the less render quality change). You should also try to set the launch option (right click on the game, properties, set launch options) "/high" (without the brackets). It will automatically launch dota in high priority on your CPU and GPU. I never tested it though, please tell me if it doesn't work I'll script a little .bat for you. I don't recommend you to run in window mode (you loose 5fps on a gt630m with that), run in fullscreen (the latest versions of source engine don't take long to reduce/remaximize). + gold from me for this explaination, noxy. EDIT : running the game in windowed mode make it run also slower (5 to 7 fps for me !) run it in fullscreen at the default resolution of your graphic card (you can google your GC to find it). Go at ...\Steam\steamapps\common\dota2 and right click on the dota2.exe (or whatever looks like this I don't have dota on the pc I'm writing with), go on properties. In the compatibility panel, desactivate the dektop composition and the visual themes. DO NOT activate anything else ! here is the sus-mentioned panel. 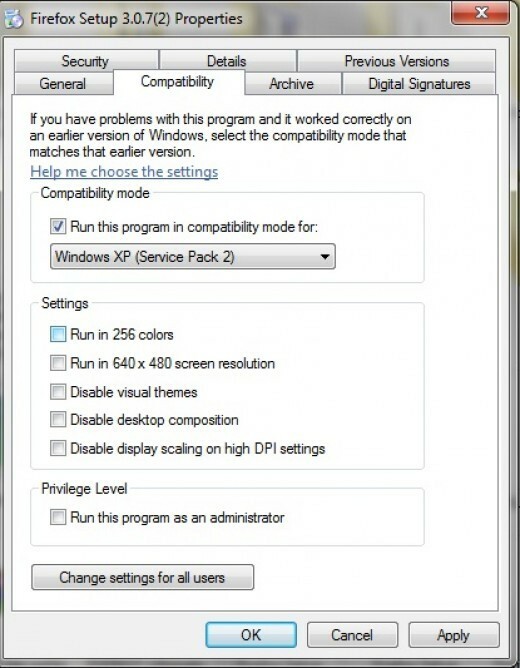 thanks to "http://vinner.hubpages.com/hub/How-to-solve-compatibility-problem-in-Windows-7" for the image ! You should try also a good video card, im sure it will also help.